The new DC-1200 Series of single-test, direct-reading colorimeters incorporates design advances that enhance reliability, improve accuracy and simplify the calibration process–all in a portable, handheld package. Designed with protection against excessive exposure to moisture in mind, the DC-1200 Series colorimeters deliver trouble-free performance in the field and lab. A microprocessor enables the factory-programmed calibrations to optimally match non-linear curves. Simply insert the blank sample and press the zero key. No more dialing in the zero. “Up” and “down” arrows enable easy calibrations to a standard for compliance monitoring a flip-top lid over the sample chamber eliminates any stray light, especially in the field, and prevents misplacing separate light caps. 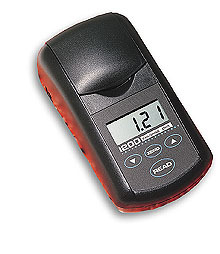 The large 3- 1 /2 " digital display presents measurements in actual ppm concentration and indicates low battery warnings. An RS-232 port is provided to interface with a datalogger or computer. The DC-1200 Chlorine Colorimeter Kit uses unit-dose DPD tablets or DPD liquid reagents. 참고: Colorimeters come complete with case, 6 sample tubes, water sample bottle and operator's manual. Kit contents vary, each kit comes complete with everything necessary to perform the specified test.